Polkrys Sp. z o.o. 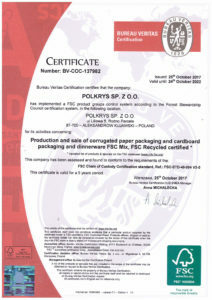 Certificates - Polkrys Sp. z o.o. Polkrys has implemented a system of controlling the supply chain of products containing forest materials for the group of products made of solid and corrugated board. On 25th October 2017 we received a certificate with number BV-COC-137982, license number (FSC-C137982). You can find us in database on info.fsc.org putting the certificate number in the search browser.